Really analyzing yourself takes time, courage, and a hell of a lot of lube. Oh, wait, it's pronounced like "annal"? Ok, just time and courage then. 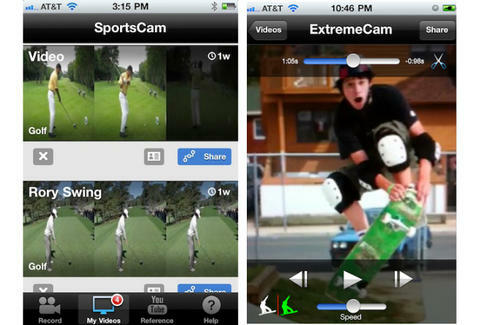 Analyze your athletic proficiency, with SportsCam. Just dropped by a couple of Hub-based scratch golfers/mobile developers, SC's a simple-to-use coaching app that lets you record and break down your specific technique (be it golf swing, jump shot, tennis forehand, rail slide, etc.) with slow-mo technology to better present your biomechanics, which're also personal histories of dudes who're mad sweet with impact wrenches. Becoming LeBron James is easy: just hit the court/course/field/gnarly quarterpipe, set the countdown timer, and record yourself in action, which you can later slow down to one frame per second, not to be confused with the insane rate of play set by cocaine bowlers. From there, you can break the action down even further by adding audio/text notations, using the telestrator-like touch drawing tools to channel your inner John Madden, and comparing your moves to those of friends and/or the pros by importing & auto-syncing their vids, and then viewing them simultaneously either side-by-side, or with an adjustable transparency overlay option, probably marking the only time you'll ever get to be inside Jacoby Ellsbury. If you're already silky smooth at lawn darts, you can check out other instructional vids (and post ones of your own) at SC's channel on YouTube, not to be confused with you lube, which is just a necessary step before really figuring out what's inside of you.